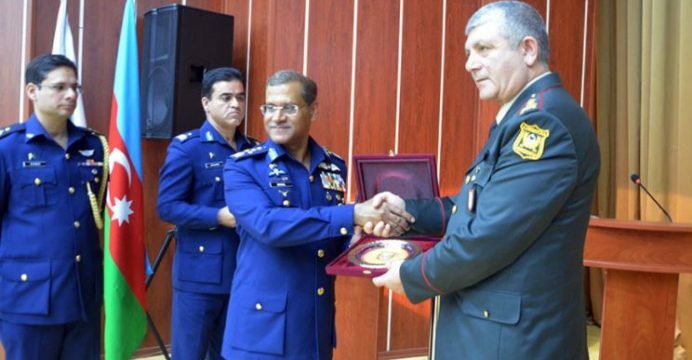 Last week, the Pakistan Air Force (PAF) Chief of Air Staff (CAS) Air Chief Marshal (ACM) Sohail Aman led a Pakistani delegation to an official visit to Azerbaijan to brief his counterparts on the Azerbaijani Super Mushshak program and to discuss potential opportunities for bilateral defence cooperation. In July, Azerbaijan ordered 10 Super Mushshak trainers from Pakistan Aeronautical Complex (PAC), joining Nigeria, Qatar and Turkey as recent customers of the platform. ACM Aman promised that the aircraft will be delivered to Baku according to schedule. Pakistan’s Foreign Minister Khawaja Asif met with his Azerbaijani counterpart Elmar Mammadyarov at the United Nations General Assembly. Radio Pakistan reports that the two officials agreed to strengthen ties across a range of fields of bilateral and regional interest. Pakistan views Azerbaijan as a prospective customer of the JF-17 Thunder multi-role fighter. In November 2016, the Azerbaijani Air and Air Defence Force had reportedly revived its interest in the fighter, which was designed to serve as an adept and affordable successor to legacy platforms, such as the MiG-21. While certified to utilize a range of Chinese munitions, such as the SD-10, PL-5EII and C-802 (among others), PAC has also begun adding third-party solutions such as a glide-bomb kit and ASELPOD targeting pod. Besides the JF-17, the PAF CAS’ visit also seems to reflect a PAF plan to direct interest towards its newly raised Airpower Centre of Excellence (ACE), especially its counterinsurgency (COIN) training element. The PAF has prided itself on constructing effective COIN capabilities, especially in terms of building extensive intelligence, surveillance and reconnaissance (ISR) coverages and undertaking timely precision-guided air strikes against targets of interest.